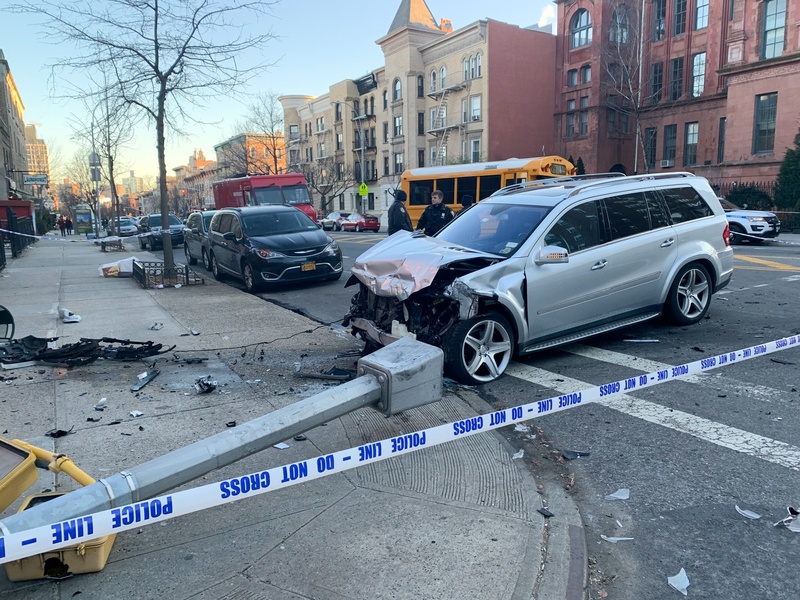 A driver mowed down a lamppost at a busy Brooklyn corner Tuesday morning, shearing it — and a massive part of his car — clean off, an indication that someone was driving far too fast. 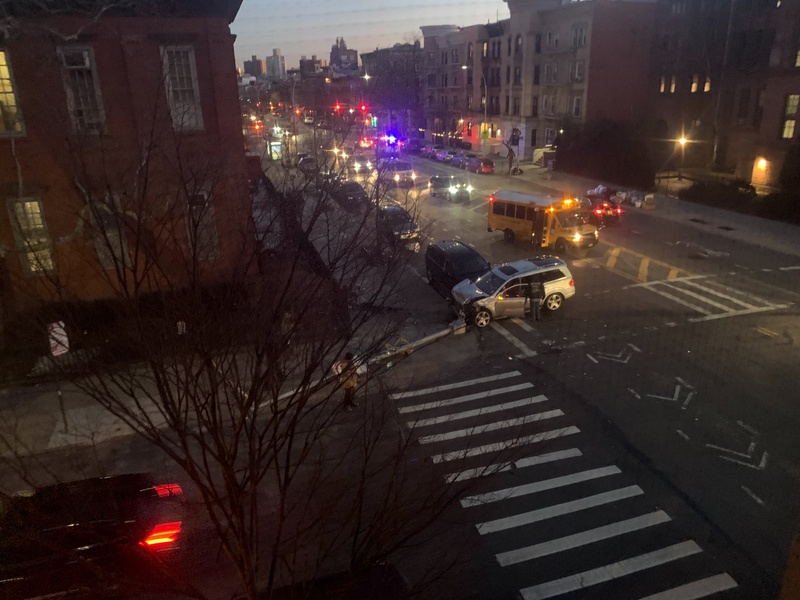 Cops did not release details of the crash, but the debris trail suggested that the driver was at the corner of Vanderbilt Avenue and Sterling Place when he either lost control of his car and slammed into the light post, or was struck by another driver. The front end of the car was tangled in the debris of the lamppost. 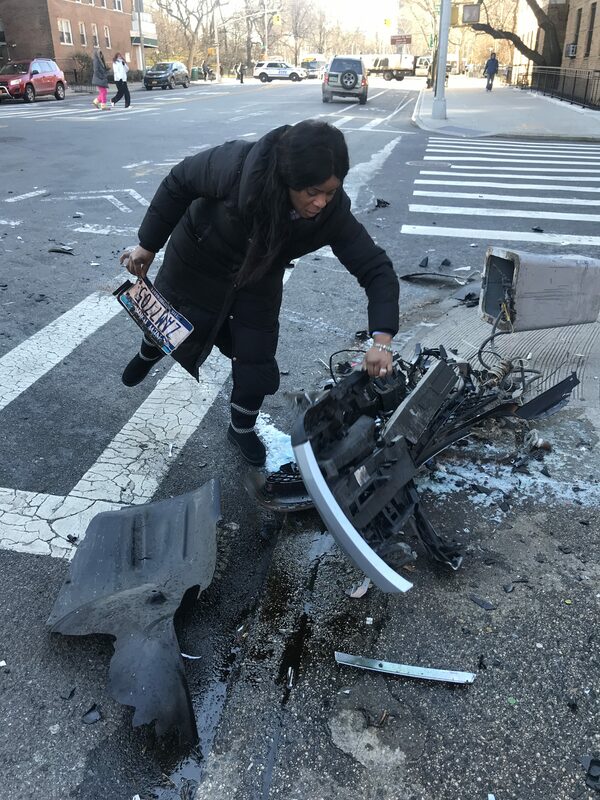 As a Streetsblog reporter took pictures, a person who identified herself as the owner of car’s wife, sifted through the wreckage to retrieve the car’s license plate. She did not offer her name, but said her husband was in the hospital. She did not answer questions about his involvement in the crash. 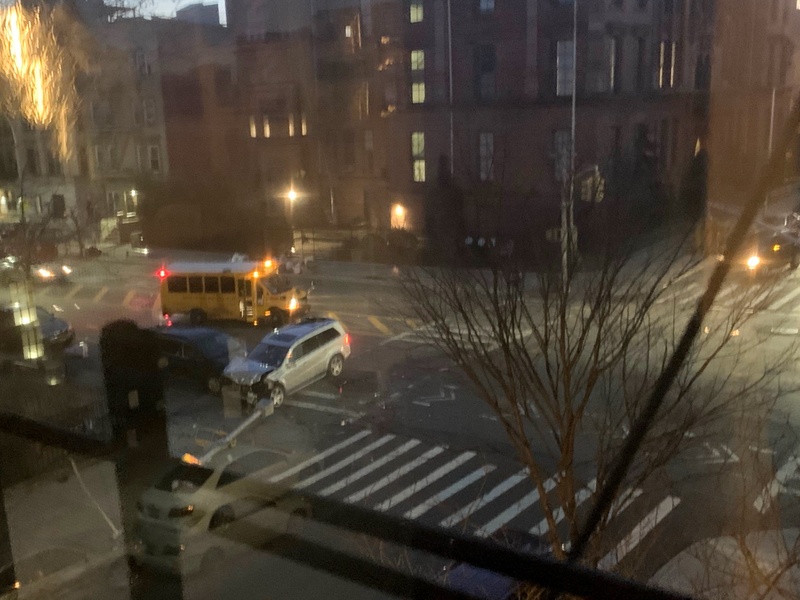 According to @howsmydrivingny, the car associated with that plate has two serious offenses: speeding and running a red light — both of which were caught on camera. The car was also slapped with tickets for 10 parking offenses. In all, the driver has paid just $350 on a total of 13 tickets. It costs tens of thousands of dollars to replace a knocked-down lamppost, a cost that is borne by city taxpayers. #NY_ZAM7705 has been queried 1 time. NYC should bill the driver for the cost of replacing that lamp post. Is the cost really borne by tax payers? I always thought there was a way for the city to bill the car driver’s insurance company. Another reason for congestion pricing: reduced expenditure on stationary objects following collisions, both public and private. Will that driver, or his insurance, have to pay for the public property he damaged with his car? There’s a bike lane right there. Set up a sting and ticket some cyclists, pay for the pole in no time. The $350 in fines found by @HowsMyDrivingNY is only a minimum. The service uses seven databases to construct a result, with only one database, Open Parking and Camera Violations (https://data.cityofnewyork.us/City-Government/Open-Parking-and-Camera-Violations/nc67-uf89/data) containing fine information. You are more likely to find fine data on recent, unpaid, or contested tickets since they are most likely to be in OPACV for some time. After tickets are paid, they are generally removed from OPACV, after which there is no way to find the fines associated with that summons. There was a section of the iron fence along the greenway near the Intrepid (in the 40’s) that was damaged by a driver of a black SUV years ago. That section of fence still has not been repaired and instead there are ugly cumbersome metal crowd control barriers placed by the broken iron fence. It is upsetting when drivers damage public infrastructure and then that public amenity remains broken for years and years. Do the fines issued to a driver correlate to the monetary damage to the property they damaged? Or are the fines set and unrelated to the actual cost to fix what the driver damaged? Glad to have found this blog. Its really a miracle that no innocent bystanders were hurt, an hour later and this would have been a very different story. Also, there’s some information missing here that I’d like to add to the record. A mini-school bus, that I believe was empty other than the driver at the time of accident (approx. 6:55am) was somehow involved in the accident. It might have been spun around in the process or its possible it might have simply slammed on the brakes and swerved to avoid hitting the vehicle, which for reason’s unknown, shot across Vanderbilt at high speed and into the light pole. If you zoom in on one the brighter high angle photo’s I posted, you can see the drivers side rear quarter panel of the bus (behind the rear tire) was hit at some point. Skid marks from the mini-van are minimal at best, and only become barely visible mid Vanderbilt. 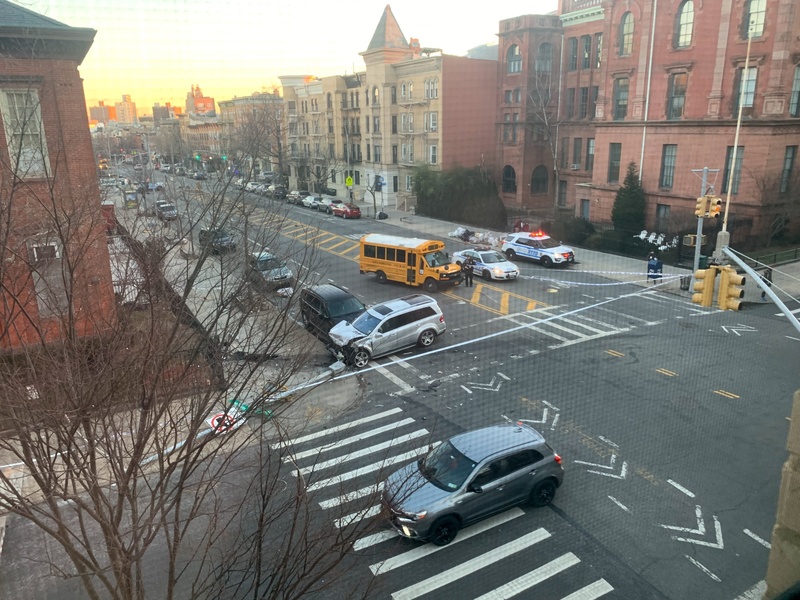 Before DOT narrowed Vanderbilt, this intersection used to regularly see this kind of accident. We’d see cars ending up on the sidewalk in front of the school, sometimes on their side, sometimes into the fence. Never the less, it seems people’s ability to be reckless with their own and other people’s lives know’s no bounds. I’ve never heard of the city recouping damages from drivers, but I’ve never been a driver, so it may do so through drivers’ liability insurance policies. Then again, maybe that’s just incorporated into the cost of NYC infrastructure.